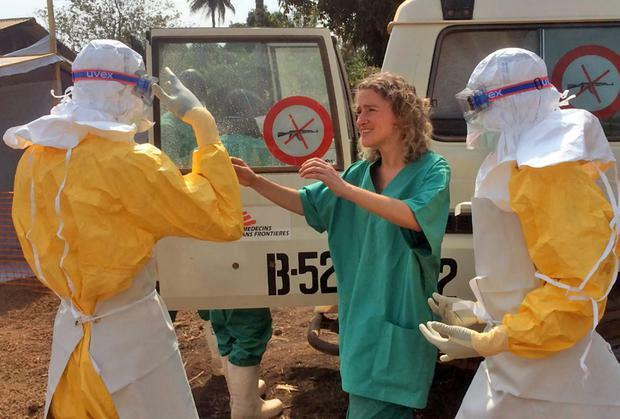 A medical aid worker has given the first eyewitness account of the horrific scenes facing doctors and nurses battling to control the outbreak of the deadly Ebola virus in some of the poorest corners of West Africa. Naoufel Dridi, who has 13 years' experience working with the charity Medecins Sans Frontieres, said: "I have never had to deal with this many bodies in these few days on any job before." Mr Dridi, who has been coordinating emergency efforts in Guinea, where the number of suspected cases has reached 122, with 78 already dead, described working with doctors in isolation wards. "You can be helping somebody by getting them a juice, or a glass of cold water, or whatever he wants because you know really he has very little chance to survive, and then less than an hour later he is dead. "Then when you are putting his body in the bag, another one behind you has died. Then another one. One old woman died with very bad external bleeding from her body, the symptoms that are the worst of Ebola. It is very difficult." The virus leads to haemorrhagic fever, causing muscle pain, weakness, vomiting, diarrhoea and, eventually, organ failure and uncontrollable bleeding. It is the first outbreak of the disease in West Africa in close to 20 years, and the first in Guinea. Morocco yesterday became the fifth country in the region to introduce strict controls at border posts to stop the spread of the disease, which has no vaccine, no cure, and kills as many as 90pc of the people it infects. Saudi Arabia said it had suspended issuing visas for visits to its holy sites for Muslim pilgrims from Guinea and Liberia, the second country where Ebola has been confirmed. Four people have died there. There are also suspected cases in Sierra Leone. "The local medical staff maybe at first are not aware of the seriousness of this illness, especially in Guinea, where it is the first time they have Ebola," said Mr Dridi (41), who is French and lives in Geneva. "We have to help them understand there are no drugs for this illness." Mr Dridi arrived back to MSF's Swiss headquarters last night after 15 days in Guinea.